he is so cute i want to give him a giant hug! Ohhh, do you need a name for him? I want to adopt Eyor!! I run by donkeys every day at home in CT and I always bring them apples. It's a mom and her little baby. They're so cute. Is it ok to give them apples? Now that I think of it? I've tagged you for the This Year I Dare meme. Ah, this donkey looks so cute; but is he really? I've heard donkeys can be quite stubborn. Oh, hey, it's the Doodle! Hurray! So cute ... I love your blog! Did you put some sun block? Animals are the best at their fuzziest - in winter! 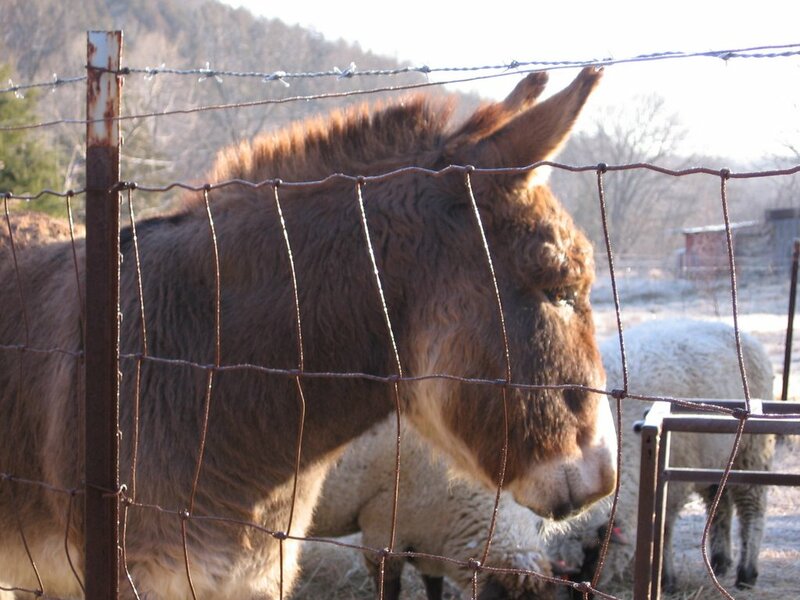 How fun to have donkeys as neighbors. I'm sure they love the apple treats. And I'm sure Dan cannot understand why I keep forgetting to bring him apples and carrots. Oops. I think maybe my New Year's Resolution should be to simply do all the memes. And when will I get to them? Oh, I'm sure most of you know the answer by now: Soon! Welcome to the farm! Well, Dan can definitely be a bit stubborn. I mean, I don't really expect him to do anything he doesn't want to do, LOL. And once in a while he does go a little berserk. Then there's his braying, of course, which defies description--and I believe breaks sound barriers. I knew you'd been wanting to see a new photo of him! Silly girl. Donkeys don't need sunblock. Sheep sometimes do, but only when I shear them too close. Yep, twice I accidentily turned The Chippers pink! What a beautiful donkey. He looks like a really sweet, mellow guy. I think Dan needs a pony,a friend to chum around with :) Love your blog and glad to see you are getting out and about. Take care.